"friday-lunch-club": Netanyahu & Obama are at point of no return: IRAN OFF THE HOOK? Netanyahu & Obama are at point of no return: IRAN OFF THE HOOK? "... Here's where the recent developments in the U.S.-Israel relationship, as well as Israel's recent "bull in a china shop" diplomatic blunders (Turkey, Dubai hit) come in. Up to now, the regional solution proposed by the U.S. was essentially: U.S. "outstretched hand" + Israel-Palestine peace track + Arab Peace Initative + Turkey-mediated Israel-Syria peace track = isolated Iran. Pick a side, in that case, looks like a reasonable alternative. But as Akiva Eldar relates (below) , Israel has essentially said, "Screw you," to the four components of that equation, while still hoping to come out with the same result -- an isolated Iran. Instead, the alternative regional solution that we're seeing emerge is something along the lines of: Arab League hedging on Iran + Gulf states hedging on Iran + Turkey hedging on Iran = Iran off the hook. That's a decidedly weaker case for the "pick a side" argument...". "The strife between Israel and the United States concerns something far bigger than the proximity talks with the Palestinians. As far as President Barack Obama and his senior advisers are concerned, Prime Minister Benjamin Netanyahu is to blame for nothing less than damaging the standing of the U.S.in the Middle East and the Muslim world. Just as Netanyahu received his standing ovation at the AIPAC conference, Obama and his advisers were ruminating over an altogether different convention - the Arab League begins a meeting Tripoli on Saturday. For the Americans, Netanyahu's Likudnik speech and the Shpeherd Hotel project matched in embarrassment the scandalous announcement of construction in East Jerusalem during Vice President Joe Biden's visit here. This year's Arab League summit will be the scene of struggle between the allies of Iran and the allies of American, and the violation of the status quo in Al Quds - Jerusalem - has direct implications for the balance of power between the sides. Over the last few weeks, Americans have been giving life support to the Arab Peace Initiative, born at the League's summit in Beirut 2002 and set to be on the agenda this week. The absence of Egyptian President Mubarak, who is recovering from an operation in Berlin, doesn't make it any easier for the U.S. to resist the efforts of Syria and Libya to suspend or possibly even terminate the peace initiative. The al-Mabhouh assassination, insulting as it was to the rulers of the Gulf, doesn't do much for the other proponents of the initiative, King Abdullah of Saudia and King Abdullah II of Jordan. The Saudi king had asked the Quartet for clarifications about Israel's latest moves in Jerusalem and specifically about Netanyahu's statement of intent for the Arab part of the city. The messages coming to the White House from Riyadh and Amman, then, were starkly clear: If you don't rein in your Israeli friends, Tehran won't be the only Middle East capital where American flags will burn. Defense Secretary Robert Gates has decisively supported General David Petraeus, the first American military man in years to describe Israel as a strategic burden on the U.S. Gates said America's rivals in the Middle East are abusing the standstill of the political process between Israel and the Arabs. He stressed that he had no doubt a lack of peace in the region was influencing American interests there. Netanyahu had been hoping to buy time until November's Congressional elections, which coincide with the deadline he set for the settlement freeze. 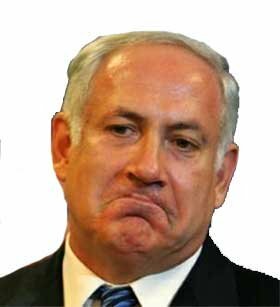 But with America's strategic interest on the line, Bibi's favorite political game (playing the Jewish community and Congress against the White House and the State Department) isn't working anymore. Obama decided his moderate Middle East coalition is more important than Netanyahu's extremist one. This is a point of no return."